Keeping on top of health and safety issues can be a constant battle. With so much new legislation being introduced, it can sometimes be difficult to be sure that you are complying fully with the Law. Our support service ensures that your business is operating within all current statutory requirements. It will also help to prevent accidents and having improvement & prohibition notices served on you, saving you the considerable time & money that would be required in order to deal with these matters. After a detailed initial analysis of your current business and compliance, our consultants will visit you on a regular basis to help you with ongoing development and refinement of health and safety throughout your organisation. surveys, safety sign surveys, telephone support and quick response by email or fax. Making sure that your staff fully understand all aspects of Health and Safety in the workplace is an important responsibility for any business owner. 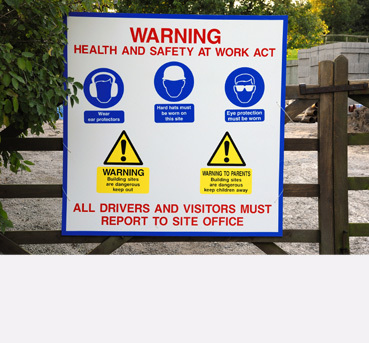 So in addition to ensuring you comply with legislation, we can help with on site training to make sure everyone knows how to operate in a safe working environment. If you need safety signs, fire extinguishers and other health and safety products, we can supply these at preferential rates, delivered free of charge. For more information or to arrange a no obligation free of charge initial consultation, please don’t hesitate to contact us.